To kick off the month I was delighted to be featured in a three page spread in 'Women Together', the Scottish Women's Institutes Magazine. They had approached me to write a nostalgic piece about my Grandma Jean Benzie and her connections with the rural. Whilst my granny was a member for over 50 years from the 1930s to the 1980s my sister is a current member and apparently my appearance in the magazine caused quite a stir. You can read the piece online Hush a bye, don't you cry, Mammy's off to the WRI. 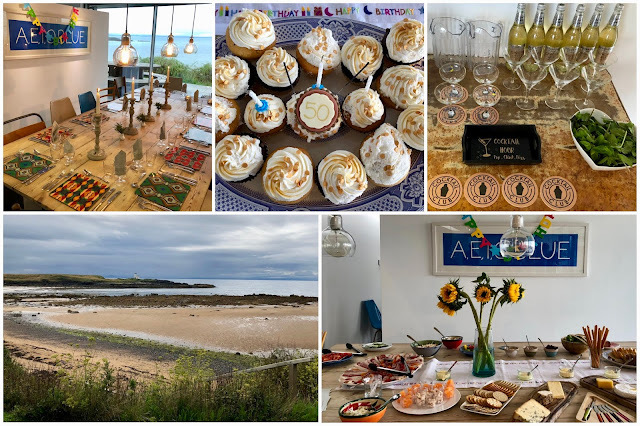 We headed to Elie to celebrate my BFF's 50th Birthday in style. She had been my plus one for a visit last year to Elie Select and had fallen in love with Midrock House. This stunning eco beach house provided a week of family celebrations before friends gathered for a weekend party. Foodie Loon was on cocktails mixing up a Heather Mule with Strathearn Heather Rose Gin, ginger ale, crushed ice and mint. Dinner was cooked by local private chef Patrick Gilmour and was absolutely divine. Whilst in the area it would have been rude not to visit some other foodie establishments. Beer and G&T's were enjoyed at The Ship Inn whilst watching cricket on the beach and morning coffee and crepes were procured at Elie Beach Cafe. A quick stop off at Ardross Farm Shop to pick up some supplies before heading to East Pier Smokehouse for lunch. Crab cakes and lobster with an awesome view. I've said it before and I'll say it again. The East Neuk of Fife really does hold a special place in my heart. I was a guest of Marks & Spencer at an event in Edinburgh to kick off their celebrations for 100 years in Scotland. Markies first opened its doors to Scottish customers in Dundee in 1918. Today they have stores in almost 100 Scottish locations with over 2500 products made from raw materials sourced in Scotland. We kicked off the evening with magical colour changing gin from Old Curiosity one of their most recent Scottish suppliers. 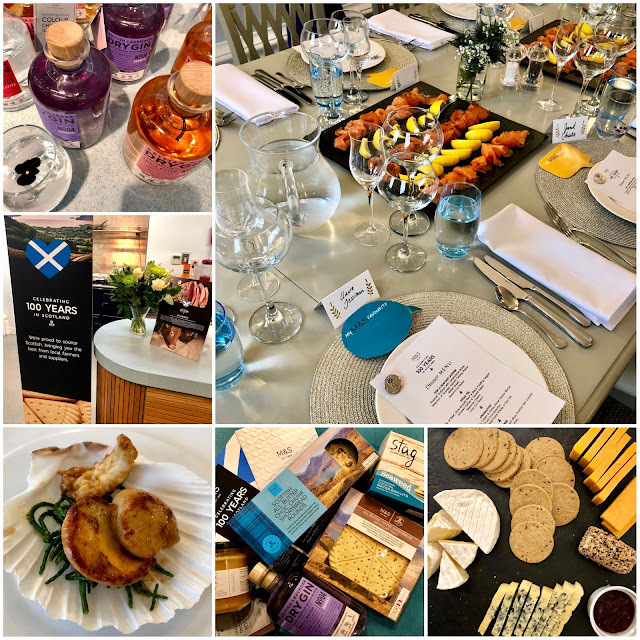 This was followed with a feast from Macsweens (haggis and black pudding) Kettle produce (vegetables) Associated Seafoods (salmon), Orkney Fisherman’s Society (scallops) Scotbeef and Highland Fine Cheeses. Look out for celebrations across their Scottish stores in the coming months. I was fair chuffed to see Stonehaven's The Bay Fish & Chips receive well deserved recognition by being named as Britain's highest ranking entry on Lonely Planet's Ultimate Eatlist. As a result there was an influx of media interest from around the world including a HuffPost video with me enthusing about it's many merits from a rather blustery Stonehaven Beach. The most hilarious bit is that they had to clarify in the subtitles what tatties are. I reckon Calum owes me an extra portion of tartare sauce and mushy peas on my next visit! Dreamers Welcome at Aberdeen’s newest coffee house and roastery Figment Coffee. (Doggies are also welcome but only in a small seating area at the entrance) Aberdonians will find it on Countesswells Road next to the fish shop and pet shop. Where the old Blockbuster video store used to be. Owner Neil’s passion for coffee is matched by food consultant to the venture Jamie Scott of The Newport Restaurant who won Masterchef the Professionals in 2014. I headed along to their launch party for a sneak preview and have plans to visit for breakfast later this week - so watch this space! To firm up on friendships formed on the Newtonhill Pipe Band trip to Amiens I invited the ladies from the band round for a night in to sample the contents of my gin shelf. The perfect way to start the weekend with Gin, Fizz, Aperol Spritz, Vol-Au-Vents and lots of laughs. Knock Knock it's Gin o'clock! Who knew that there is such a thing as the ‘wrong kind of reusable cup’. On a rail journey to Edinburgh, Scotrail refused to serve me in my one so I took to twitter and then I spoke to The Scotsman about it. 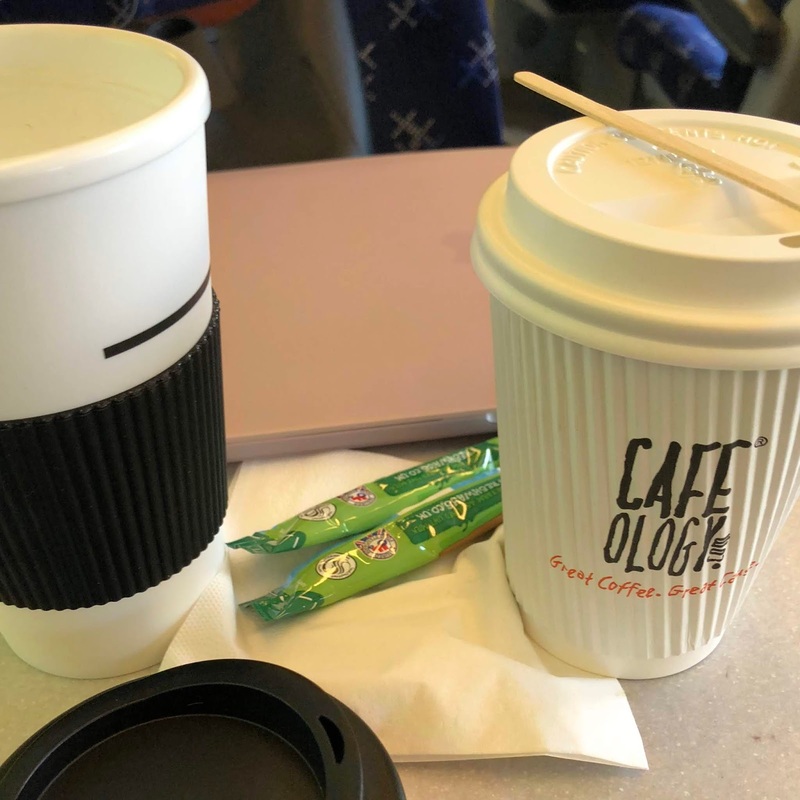 ScotRail causes anger with confusion over reusable coffee cup rules. Have a read and let me and Scotfail know if you think this policy should be reviewed and common sense prevail. 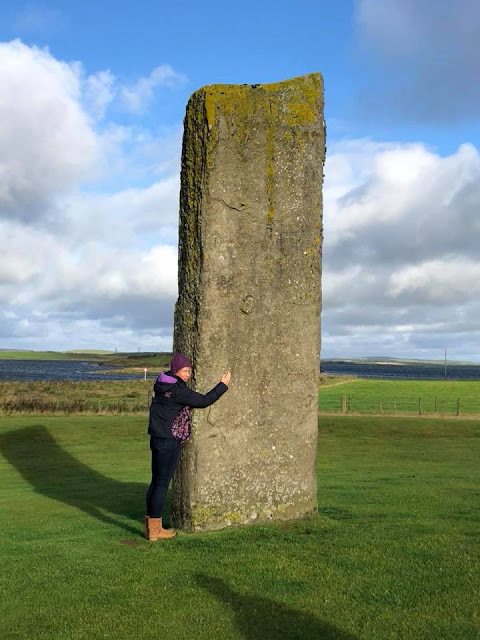 I enjoyed an amazing 3 day trip to Orkney with so many sights and tastes ticked off. Highlights were hugging a 5000+ year old stone and eating and drinking my own bodyweight from a host of wonderful producers. Whisky, Gin, Cheese, Beer, Beremeal, Oatcakes, Vinegar and more. Blog post coming soon but suffice to say I had a great time exploring this beautiful island and discovering it’s food, drink and crafts. My flight from Orkney had barely touched down when it was time to head off to Dundee for the long awaited opening of the V&A. Delighted to report that it totally exceeded my expectations. Over 500,000 People are expected to visit over the coming year. If you'll be one of them I've pulled together a comprehensive blog post that will answer your questions and provide you with all the practical information you need make your visit as smooth and enjoyable as possible. 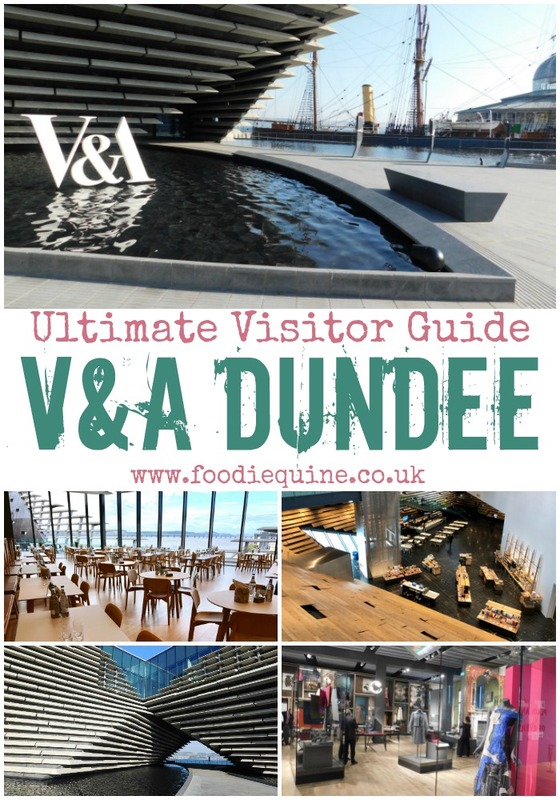 Ultimate visitor guide to the Dundee V&A. To celebrate National Rice Week 2018 I took a culinary journey around the globe in rice with 75 international recipes which showcase the versatility of rice from breakfast through to lunch, dinner and dessert Featuring dishes from India, Mexico, Greece, Asia, Spain, Japan, Thailand and more. Whether you’re looking for inspiration to use up leftovers, rustle up a quick midweek meal, or discover a new go to salad there’s something for you below in this selection of globally inspired rice based dishes. With so much gallivanting it took me until late in the month to get round to publishing a recipe, but it was worth the wait! One of your 5-a-day in chocolate and cake form. Beetroot and Chocolate Muffins are quick and easy to make and super moist and moreish. Use beetroot juice to make a naturally pink icing to finish them off to perfection. Lamb Mac and Cheese is Scottish comfort food at its best and then some! Scotch Lamb PGI stirred through creamy macaroni cheese before being topped with lashings of Scottish cheddar and baked in the oven until ooey and gooey. The best bits of macaroni cheese and shepherd’s pie all rolled into one midweek meal which the whole family will enjoy. Final recipe for September was a gluten free Autumnal bake, ideal to use up black bananas which otherwise may go to waste. 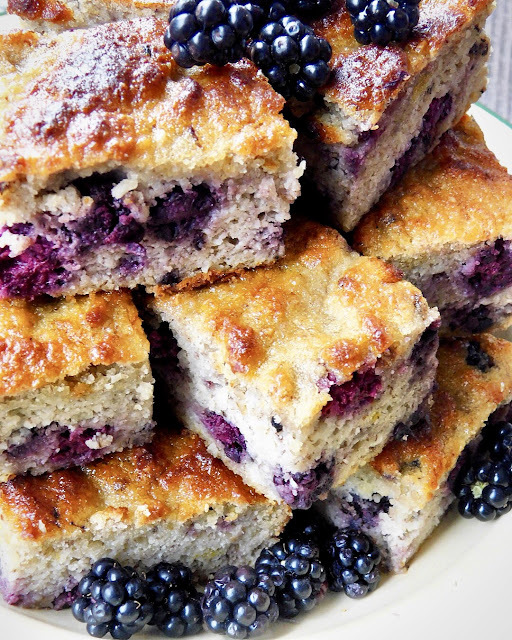 Combined with brambles (blackberries) foraged from the hedgerows it's an economical treat. Moist and moreish, Banana, Bramble and Almond Traybake is perfect served with a cuppa or as a dessert with lashings of custard. Looking forward to October and it's hard to believe that it will soon be the end of term and time for the Tattie Holidays. No tattie picking here though, instead we're headed for a fortnight in Orlando. Skipping Disney this time round and instead doing Universal Studios, Harry Potter, Discovery Cove, Busch Gardens, SeaWorld and Kennedy Space Centre. I'll also be celebrating my birthday when we're there so any recommendations of where to spend it most welcome. At the moment my thoughts are breakfast at Peach Valley Cafe or First Watch and dinner at Outback or Melting Pot. 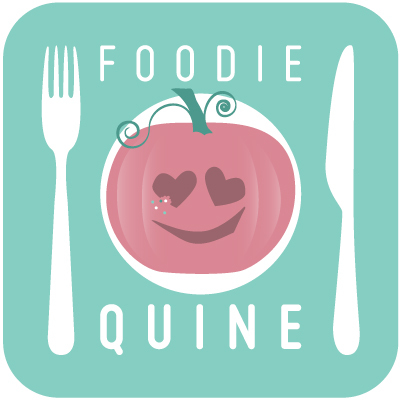 But before that this week I'm heading to launch events for Hood Magazine, The Gin Bothy Experience and Arnprior Pumpkins. Throughout the month I'll also be sharing plenty of Halloween content including a post I've got lined up of Pumpkin Patches in Scotland. There will also be recipes to encourage you to make the most of your pumpkin. These orange beauties are food - not just decoration!